Background: Mutation in the B RAF at V600E has been well implicated in the carcinogenesis that makes it as an attractive therapeutictarget. In the present study, we sought to identify the basis of V600E mutation at functional and structural grounds. The study also endeavors in identification of small molecule as a potential candidate with considerable pharmacological profile than available BRAF inhibitors through computational approaches. Methods: The functional effects of V600E mutation was predicted using SIFT and Polyphen servers. Protein structural alterations werepredicted using SDM server and RMSD calculations. 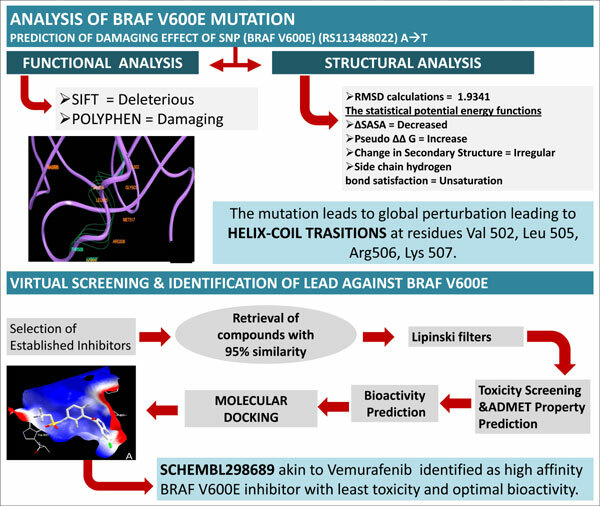 Virtual screening was performed considering existing BRAF inhibitors viz., Vemurafenib, Sorafenib, Dabrfenib, Trametinibthat formed query compounds for shape similarity search by Tanimoto similarity indices with a threshold of 95%. Compound with high affinity as similar to query compound was retrieved and screened for its ADMET properties. Results: The SNP was shown to be highly vulnerable to malfunction and have damaging effects. Mutated protein showed that the secondary structure was irregular and side chain hydrogen bonds were unsaturated. The superimposition of wild onto mutated V600E BRAF revealed helix-coil transition occurring wherein residues Val 502, Leu 505, Arg506, Lys 507 assumed coiled conformation in the mutated BRAF. Virtual screening led to identification of SCHEMBL298689 akin to Vemurafenib as high affinity B-Raf inhibitors; with least toxicity and optimal bioactivity. Keywords: B-Raf V600E, Mutational studies, Helix-Coil Transitions, Virtual Screening, ADMET profiling, B-Raf inhibitors. Keywords:B-Raf V600E, Mutational studies, Helix-Coil Transitions, Virtual Screening, ADMET profiling, B-Raf inhibitors. Abstract:Background: Mutation in the B RAF at V600E has been well implicated in the carcinogenesis that makes it as an attractive therapeutictarget. In the present study, we sought to identify the basis of V600E mutation at functional and structural grounds. The study also endeavors in identification of small molecule as a potential candidate with considerable pharmacological profile than available BRAF inhibitors through computational approaches.